Explore Austin's surroundings by going to San Antonio (Natural Bridge Caverns, The San Antonio River Walk, & more), Fredericksburg (National Museum of the Pacific War & Wine Tours & Tastings) and New Braunfels Conservation Society (in New Braunfels). 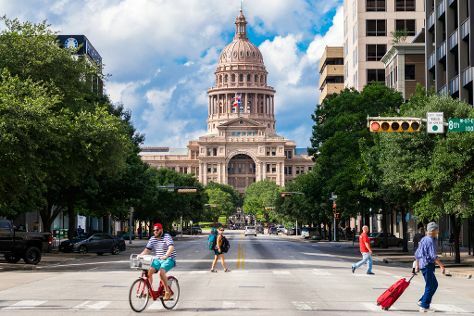 There's much more to do: ponder the world of politics at Texas State Capitol, take in the views from Congress Avenue Bridge / Austin Bats, take an in-depth tour of Bullock Texas State History Museum, and steep yourself in history at The Driskill. For traveler tips, reviews, and other tourist information, read our Austin trip itinerary maker tool . Houston to Austin is an approximately 3-hour car ride. You can also take a bus; or fly. Expect a daytime high around 71°F in November, and nighttime lows around 52°F. Cap off your sightseeing on the 20th (Tue) early enough to travel to Zion National Park. Change things up with a short trip to Fort Zion Gift Shop, Petting Farm, Restaurant & Ice Cream Parlor in Virgin (about 42 minutes away). Spend the 21st (Wed) exploring nature at The Narrows. Spend the 23rd (Fri) exploring nature at Zion National Park. And it doesn't end there: take a memorable drive along Zion Canyon Scenic Drive, explore and take pictures at Zion Shuttle, get outside with The Subway, and take in breathtaking views at Zion's Main Canyon. For where to stay, photos, reviews, and more tourist information, use the Zion National Park trip itinerary app . Do a combination of flight and car from Austin to Zion National Park in 9.5 hours. Alternatively, you can drive; or do a combination of bus and car. Traveling from Austin to Zion National Park, you'll gain 1 hour due to the time zone difference. When traveling from Austin in November, plan for little chillier days in Zion National Park, with highs around 61°F, while nights are much colder with lows around 29°F. On the 25th (Sun), you're off tohome.